...that slipstream space translations for a Phoenix-class colony ship require 4.3 quadrillion (4.3 * 1015) calculations of the quantum field per second? ...that a glitch in Halo: Reach Forge can make the player impervious to all forms of damage except for assassinations? "I'm not afraid to die. What we're doing is so much bigger than me, and I know there will always be people to continue the fight, people like you." Commander Maya Sankar was a human operative of the UNSC Navy's Office of Naval Intelligence, serving Section Three. Sankar infiltrates insurrectionist organizations under the cover identity "FERO" and managed to gain notable influence within the rebel community in the post-Covenant War years. 1.3 Undercover work as "FERO"
Before Maya Sankar became an agent for ONI, she dreamed of being a professor since childhood. Consequentially, she studied xeno-psychology since she "wanted to know how other minds work." Due to her expertise in understanding alien behavior, she was inducted into ONI. During basic training, Noah Reibach served as Sankar's instructor. 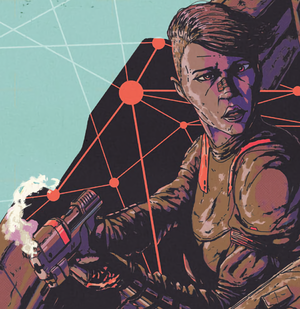 Reibach would continue to operate as her mission coordinator during her ONI career, including her deep-cover mission to infiltrate insurrectionist cells in the post-war era. During the Human-Covenant war, she was tasked with writing reports on Sangheili and Kig-yar psychology. For several years, Sankar worked undercover within various insurrectionist cells, attempting to encourage insurgents to adopt more peaceful methods of bringing about changes in the Unified Earth Government's colonial politics. She would gain legitimacy among the rebels by revealing the atrocities of ONI using classified intelligence on the organization's tactics and assets. During the investigation of the Master Chief, Benjamin Giraud was contacted by conspiracy theorist Mshak Moradi, who revealed that "FERO" was about to get into contact with him. "FERO" would later contact Benjamin Giraud, using voice distortion software to cloud her true identity. "FERO" began to tell Ben to establish the truth surrounding the Master Chief, and release it to the public, thus creating havoc and attention in the colonies. Yet to really hinder and usurp the Office of Naval Intelligence, a more delicate plan would need to be set up, to which "FERO" told Ben to set up a burn meeting in which the Unified Earth Government senators and high-ranking ONI officials would attend. After John-117 apparently attacked a peace conference between the UEG and an alien species on Biko, FERO leaked the news onto human public networks and news sites. This caused many people to denounce the Master Chief, with much of the public feeling betrayed by John's apparent disloyalty. FERO evidently intended to also reveal the Office of Naval Intelligence was responsible for abducting children for the SPARTAN-II program and for ultimately psychologically transforming the Master Chief into a traitor. When a meeting was scheduled between the UEG senate and ONI to discuss the Biko event, FERO intended to help Giraud reveal ONI's Spartan-II conscription methods before the UEG senators. She apparently hoped that the senators would realize that they had been kept unaware of ONI's controversial acts, and thus heavily reprimand the intelligence agency. When the meeting occurred, FERO patched Giraud into the congressional chamber's main display. Giraud informed the senators of ONI's atrocities and blamed the directors of ONI responsible for the acts just before his feed was cut off. Before ending their call, FERO told Giraud that he had ignited a revolution and that he was now under her protection. The senators ultimately did not believe Giraud's claims. Several days later, FERO contacted Giraud to warn him that ONI operatives had found him and told him to leave his apartment. As Giraud attempted to escape, the agents tracked him down and attacked him. However, FERO arrived at the scene and killed the agents. As they escaped the area, FERO gave Giraud access to her movement's funds and safehouses. Claiming she believed ONI to be vulnerable, FERO and her organization were making preparations to attack the agency before it recovered. However, Giraud revealed that he had knowledge of a lead on Bliss that would help them in their case against ONI and he convinced FERO to hold off on her plans. On Bliss, Giraud found an abandoned ONI facility with an active communications server that documented all of ONI's acts. Some time before Giraud appeared in public with his info, ONI ordered FERO to kill Mshak Moradi because he was about to discover her real allegiances. After she had carried out the assassination mission, Sankar's handler Noah Reibach noted that her weapon had not registered as fired during the operation; she implied that she had killed Moradi without it in a particularly gruesome manner. Meanwhile, the UEG announced to the public that they had apparently discovered that FERO was an arms dealer that supplied Sapien Sunrise for their raid on the Biko embassy. When Giraud attempted to publicize his discovery on Barrier's ECB News, he was arrested by federal agents for treason against the UEG for working with FERO. After Benjamin Giraud's capture and imprisonment at ONI's Midnight Facility, Sankar continued her undercover work as FERO, having gained the trust of many insurrectionists. During one of her speeches to a group of over 100 people, a squad of ODSTs extracted Sankar, killing 26 and injuring 41 of the insurrectionists in the process, which angered her considerably. Noah Reibach contacted her inside the ship and told her that she was being brought to Midnight Facility to be briefed. Upon reaching Midnight Facility, Sankar decided to meet with Giraud in his Cube before being briefed. Upon reaching Cube-349, Sankar told the AI accompanying her to make the glass transparent. Upon meeting him, Giraud was relieved she was still alive, not knowing that she worked for ONI. Giraud told her about the apology letter he had been writing and that he would personally thank her for saving his life. Sankar was about to tell Giraud the truth of the two ONI agents sent to kill him but was cut off by Michael Sullivan on COM. When Sullivan referred to Sankar as Commander Sankar, Giraud realized she worked for ONI, which caused him to go into a fit of rage. This prompted Sullivan to administer a gaseous sedative on Giraud. Sankar headed straight for Sullivan's office and expressed her anger towards ONI's treatment of Giraud. Sullivan explained ONI were going to use Giraud as a PR asset and record a message for the public. Sullivan warned her to stay away from Giraud, and Sankar warned him to stay away from her. After her argument with Sullivan, Sankar left to be briefed by Reibach who informed her of attacks that had happened on five human colonies. One of the colonies, called Conrad's Point, had a large New Colonial Alliance presence, and to prevent whatever destroyed the colonies from falling into the NCA's hands, Sankar was tasked with gathering intel on the situation by infiltrating the NCA, with help from the AI Black-Box. After arriving at Conrad's Point and meeting up with her contact, Ari Rezneck, in the crater caused by the Guardian's activation, they infiltrated the rebel base where they discovered one of FERO's followers, Bostwick, and the insurrectionist leader Ilsa Zane. Upon the discovery of Zane, ONI assessed that the opportunity to strike is at its greatest and immediately called in an airstrike on the location. As Maya attempted to leave with Bostwick and Rezneck, Ilsa confronted them, killing Rezneck and injuring Bostwick, only stopped by the beginning of the airstrike. Maya barely escaped with Bostwick, now no longer trusting ONI, due to nearly being killed in favor of eliminating Ilsa Zane. She proceeded to an unsanctioned safehouse where she was secretly keeping Mshak Moradi alive, to seek his help involving the anomalies that apparently destroyed Conrad's Point as well as allegedly killed the Master Chief John-117. The visit was cut short when the UNSC found the safehouse and attempted to bring her in. She fled with Mshak, Bostwick and Black Box, only to be almost immediately be captured by Kig-Yar pirates. After a confrontation nearly resulting in the death of Bostwick, Maya negotiated the group's freedom in exchange for repairing the slipspace engines of the decrepit Kig-Yar ship. Once free, Black-Box and Mshak were able to determine the next appearance of the anomalies. Maya, despite the protests of BB headed to the planet to attempted to warn them of the impending danger, however, they were attacked by a vengeful Ilsa Zane and upon crashing were sidetracked by Dasc Gevadim and his Triad cult who were aware of the impending event and saw it as a divine ascendance. As the anomaly began they escaped the cult to attempt to warn the colony. On the way the were caught in the middle of fighting between the UNSC and the Insurrectionists. Realizing nothing could be done to save the colony, Maya broadcast the destruction caused by the rising Guardian to the rest of the outer colonies while warning them that the UNSC would not help them. Before Maya revealed who she was, Bostwick cut the broadcast short and killed Maya to prevent her from being captured by ONI and to preserve her as an icon and a martyr for the outer colonies. After being killed by Bostwick, ONI recovered Sankar's brain and Black-Box cataloged her as an exceptional candidate for AI assimilation after exploring her memories. The creation of a new smart AI based on Maya's neural pathways was successful, and this AI was interviewed by Black-Box upon its creation. FERO is portrayed by American actress Janina Gavankar in Hunt the Truth. One of FERO's script covers for Hunt the Truth Season 1. Janina Gavankar in costume as FERO in The Chase and the Hunt fan trailer. ↑ Xbox Wire: Halo 5: Guardians #HuntTheTruth - Has the Master Chief Gone AWOL?